I’ve been saying it for a while now, why do people always think of Stellenbosch when they want to go wine tasting? Constantia has some of the most beautiful wine farms, world-class wines and it’s right next door. 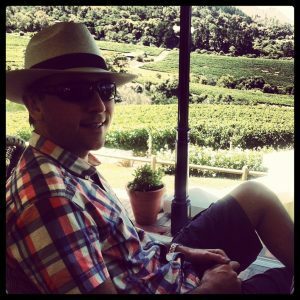 I have a couple of favourites, but one wine farm that I keep coming back to is Constantia Glen. Their wine tastings are very generous, and you taste 5 of their wines. The wines are all top quality – and it’s one wine farm where I often leave with a couple of boxes in the boot! They pair the wines with an unbeatable view over the vineyards and if you’re feeling peckish, their range of platters make the perfect accompaniment to the wine. Last Saturday we spent a lazy lunch at Constantia Glen, tasting the wines paired with their cheese and charcuterie platter. They’ve done a lot of work on the main building to increase the number of tables as well as improving on the already beautiful setting. Want some more information? 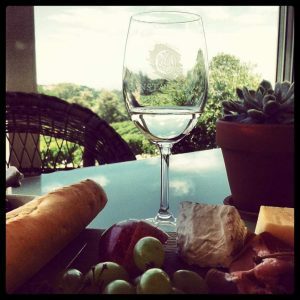 Then read what one of our other writers thought about Constantia Glen! If you’re looking for a fun way to celebrate Valentines Day, there’s a lovely event being hosted by Constantia Glen, Eagle’s Nest and Beau Constantia – I’ve included the details below. Indulge your love of Rosé and come to Constantia Glen on Saturday, 15 February 2014, for a Rosé Festival Celebration on the lush lawns with spectacular views amidst the vineyards. For this summer celebration of Rosé, Constantia Glen has teamed up with neighbouring wine estates Beau Constantia and Eagles’ Nest, all situated on the upper reaches of Constantia Nek, the pinnacle of the Constantia Valley Wine Route. The cellars will be presenting their Rosés as well as a selection of other wines from this remarkable appellation known for its classically crafted, cool climate wines. Visitors will be spoiled with a traditional spit braai and salads and can purchase wines to take home, including the newly released 2013 Constantia Saddle Rosé. Booking is essential for the Rosé Festival Celebration at Constantia Glen’s Manfred’s Legacy on Saturday, 15 February 2014 from 12h00 to 17h00. Tickets are available at the participating farms at R250 per person. The event is closed to children under the age of 18. * Note: I was invited by the Constantia Glen team to enjoy a tasting and platter, but every other time that I’ve visited this farm it’s been for my own account. I visit every couple of months.